We absolutely love City Hall! We love when couples tell us this because it means the day will be center around what’s really important — your love. We can run around the city, go out for fun cocktails, or just do a few quick snaps for your ceremony. We’re thrilled to be your witness, so honored you chose to include us, and totally respect that it’s your special day. Pricing ranges from $500-$2000+ when it’s just the two of you. $1400+: Let’s run around the city and document your big day! We’re happy to pop some bubbly, swing by the bridge or Palace of Fine Arts, or catch sunset over the Pacific Ocean! Timing is flexible at $400/hour when you book over three hours, with the option of half hours. We absolutely love when you bring your closest crew, and we get that sometimes it just wouldn’t feel real without them! Let’s make sure to get a few shots with them, and also get the portraits of just the two of you. Are you all heading out to lunch after? Or on a cable car later?! Might be fun to bring us along to capture that, too! Pricing ranges from $650-$2500+ when it’s an intimate wedding with about 25 or fewer guests. 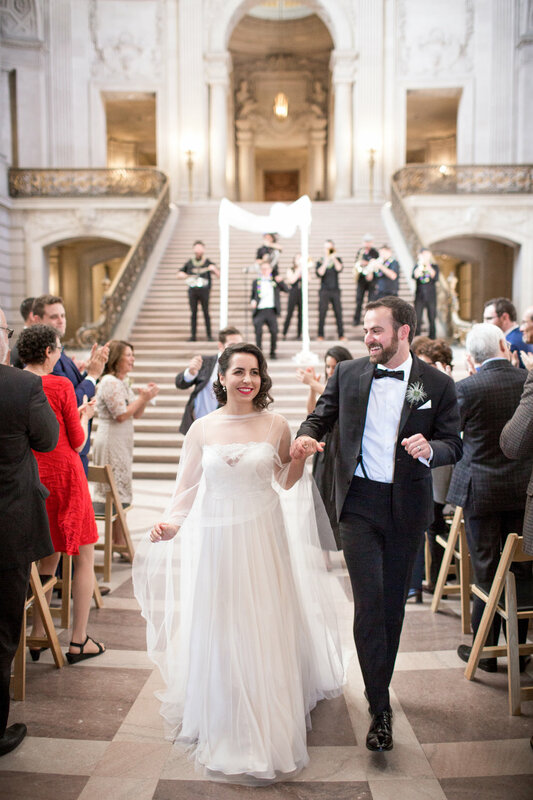 $1275+: Everything around City Hall & your ceremony, plus whatever the rest of the day holds! Add on an hour or three for a reception, or to cruise the city in that sweet Rolls. Feel free to take a break in between City Hall and evening plans. Timing is flexible at $450/hour when you book over three hours, with the option of half hours. 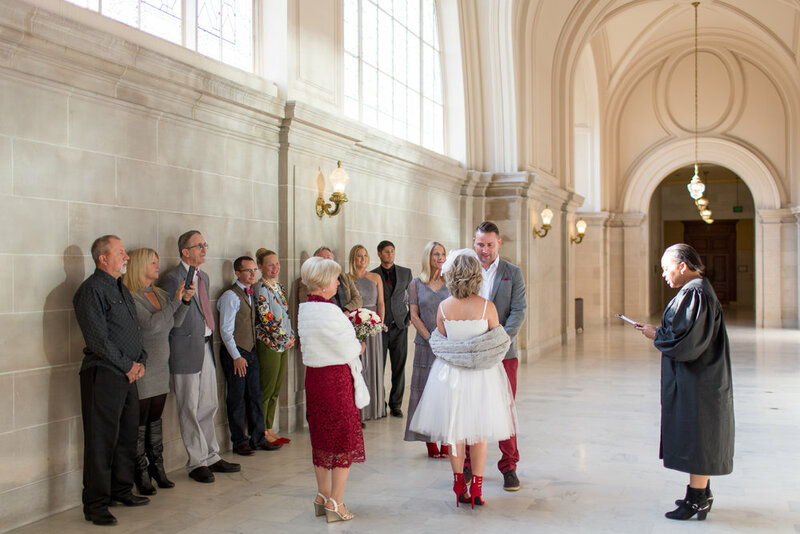 What’s better than getting married at City Hall? 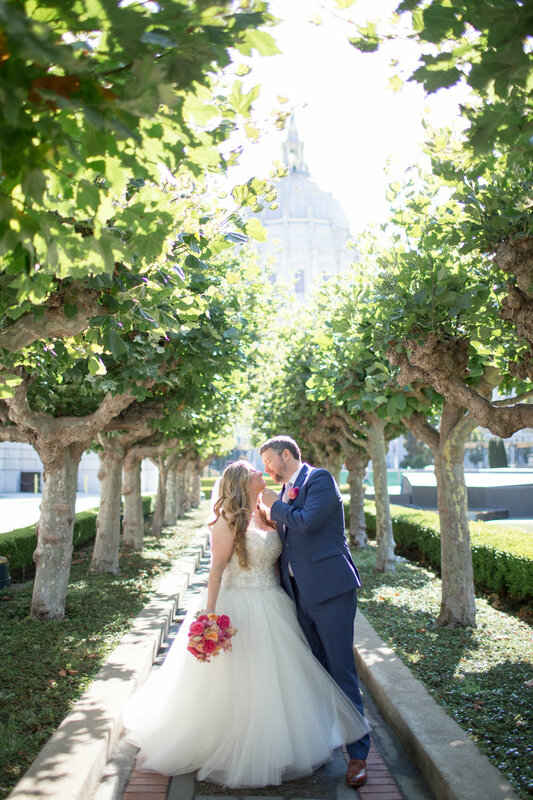 Getting married in your own private spot at City Hall! Whether you rented the Mayor’s Balcony, Fourth Floor, or the whole thing, your wedding deserves all the bells and whistles. We’ll bring two photographers to make sure we get lots of fun candids with your guests, and are happy to start the day with you for some getting ready shots and go through the party, too! Pricing ranges from $1250-$3000+ when it’s a full wedding with many guests. 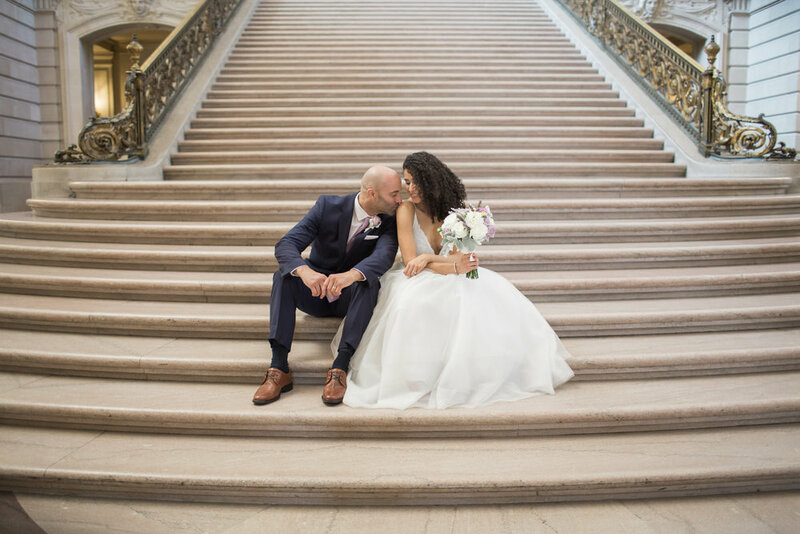 $1250: Two full hours of photography at City Hall, including the ceremony, couple portraits, all the posed pictures with family and friends, and lots of candids! $2000+: Everything at City Hall, plus whatever the rest of the day holds! Let’s start at your hotel downtown for some intimate getting ready moments, and go through the sparkler exit. Feel free to take a break in between City Hall and evening plans. Timing is flexible at $550/hour when you book over three hours, with the option of half hours. An engagement session is also included when you spend over $3000. Kathryn was the best photographer I could have ever asked for! She was such a sweetheart. She captured some of the most beautiful moments that I will forever cherish. I couldn't have asked for a better photographer to share this special day with us. 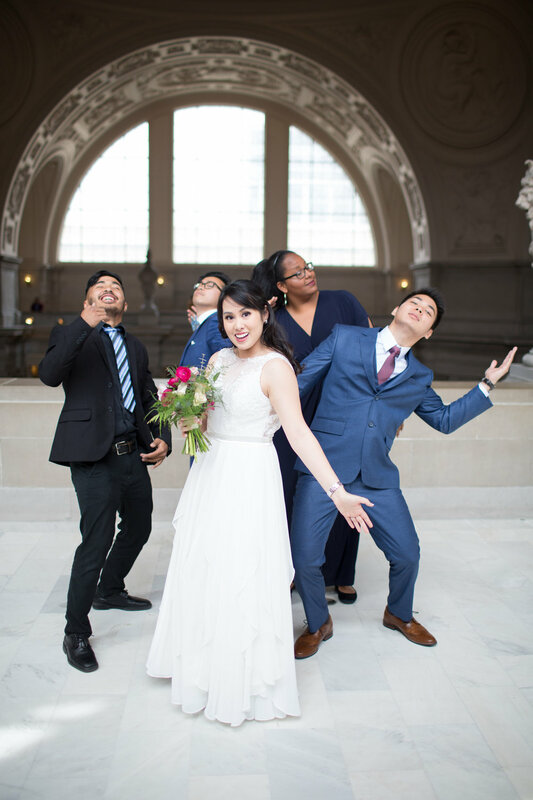 Kathryn, Gina, and James have a combined 12 years of experience shooting at San Francisco City Hall, and their passion for the building is undeniable. Kathryn loves having a team with multiple photographers because it means we’re more likely to be available for your big day! Whether you’re booking a photographer last minute, or you’re booking a big wedding a year out and want us all there, we should be able to accommodate whatever you need!